Christians United For Israel founder and head John Hagee has written and said so much, in books billed as selling millions of copies and in sermons broadcast around the world, that the best strategy to distract from the disturbing content (which we've extensively documented here at Talk To Action - see 1, 2, 3, 4, 5) of this material is ad-hominem attack. A recent op ed in the American Thinker does just that, and it's a desperate ploy. For all the seemingly-endless torrent of punditry on the question--is Christian Zionist support for Israel actually good for Israel or good for Jews?--shockingly few commenters seem to have bothered to examine John Hagee's actual words and writings. But ever so slowly, since John Hagee and his Christians United For Israel took the stage in 2006, word is getting out that Christian Zionism has a very dark, even a malevolent, underside. The inherent tensions, between CUFI's carefully managed PR image and all that lurks beneath, have now surfaced in the agonizing spectacle of Christians United For Israel Executive Director David Brog's defense of Glenn Beck, slated to speak at CUFI's yearly Washington DC summit this summer--with Brog reduced to complaining that critics of Hagee and CUFI were fixating on the "anti-Semitic needle in the philo-Semitic haystack". The Haystack, however, is not Glenn Beck's conspiratorial ouevre but, rather, John Hagee's own books and sermons-- and "philo-Semitic" is not how any impartial oberver who had examined it would identify Hagee's body of work, which includes a claim that the Anti Defamation League characterizes as a "Classic anti-Semitic Myth". 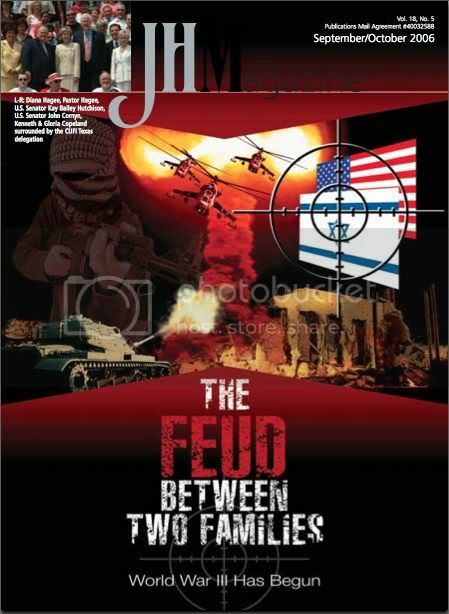 In February 2007, activist journalist Bruce Wilson quoted Christians United for Israel (CUFI) founder and Chairman Pastor John Hagee as having advocated an attack on Iran in order to bring about Armageddon. There was one major problem: Hagee never made the statement; in fact it is a fundamental contradiction of his theology. The quote Wilson attributed to Hagee was written by another activist journalist, Sarah Posner, in her own voice, as part of her (albeit hopelessly inaccurate) characterization of Hagee's views. Some may be inclined to believe that Wilson simply made an error. But just a few months before attributing the quote to Hagee, Wilson published a lengthy blog post citing Posner's article, including the paragraph containing her relevant assertion. Though he may not have been the first to do so, the sequence of events suggests that Wilson knowingly misattributed the quote to Hagee. Despite this, and the fact that Hagee does not advocate such an attack or seek to speed the "end of days," the quote is widely cited by Hagee's detractors. Wilson and his ilk ought to be relegated to that dark corner of the internet generally ignored by the open-minded mainstream. The irony of Morgenstern's attack is that, in itself, the jeremiad contains easily debunked assertions, such as the claim that John Hagee "does not advocate such an attack [on Iran]".This is directly contradicted by Bill Moyers video footage of Hagee speaking at the 2007 Christians United For Israel conference in Washington DC. And, John Hagee has indeed sought to "speed the end of days", as demonstrated by the bi-monthly publication of Hagee's own church. I'll address these aspects at length further in this piece. But first to the misquote. On this fact at least, Morgenstern is correct. So, for that, I do apologize to readers. Since my early period of writing on John Hagee, I have learned to rely on primary sources, Hagee's actual books and sermons, which contain material possibly more offensive than what's incorrectly attributed to John Hagee or Hagee's real, well-known statements that have gained the sort of widespread mainstream media coverage that Hagee's 2005 "God sent Hitler" sermon statement received in late Spring 2008. About six months had elapsed since my post that referenced Posner's text, and my explanation for my subsequent misquote is rather mundane; being human, hence fallible, I forgot. The misquote, which I apparently encountered from one of those 14 Internet sources, probably didn't look like the characterization by Sarah Posner because of ellipsis--several sentences were cut out to produce the misquote, which popped up in stories by authors who at the time I apparently judged to be credible sources. "Esau's descendants included Haman, whose diabolical mind conceived the "final solution"--the extermination of all Jews living in Persia. It was Esau's descendants who produced the half-breed Jews of history who have persecuted and murdered the Jews beyond human comprehension. Hagee's claim that John Toland asserted that Hitler was without question partially Jewish is flatly false, a fact that readers with Amazon.com accounts can see for themselves on page four of Toland's book. What Toland wrote in Adolf Hitler was that "There is the slight possibility that Hitler's grandfather was a wealthy Jew named Frankenberger or Frankenreither." Why John Hagee would feel the need to falsify Toland's writing in this manner, which might as well be a misquote, I'll leave alone for now. Meanwhile, as readers can see in the short promotional video for Moyers' March 8, 2008 PBS/Bill Moyers Journal special report, Hagee stated, "It is time for America to consider a military preemptive strike against Iran to prevent a nuclear holocaust in Israel and a nuclear attack in America." "There will soon be a nuclear blast in the Middle east that will transform the road to Armageddon into a racetrack. America and Israel will either take down Iran, or Iran will become nuclear and attempt to take down America and Israel." As Bill Moyers' special PBS report underlined, John Hagee's Christians United For Israel facilitates lobbying against any land-for-peace settlement whatsoever to resolve the Israeli/Palestinian conflict. Hagee-affiliated ministries also support the rapidly growing Jewish settlement of Ariel, which protrudes deeply into territory that any land-for-peace settlement would likely seek to make part of a new Palestinian state, posing an increasingly intractable on the ground reality that could almost single-handedly prevent a peace deal. Given that John Hagee has consistently, over the course of his several decade career as a pastor, writer, and religious leader, predicted a coming, apocalyptic war centered in the Middle East and around Israel, it is easy to see how Hagee's superheated, bellicose rhetoric, and CUFI's lobbying efforts, help to make such a real-world conflict more likely. Moving on to the issue of theology--while I have come to believe that John Hagee's evinced eschatological views are, on the surface at least, quite tangled and often contradictory, Ari Morgenstern's claim that efforts to bring about Armageddon would amount to "a fundamental contradiction of his [Hagee's] theology" is jarringly refuted by the September/October 2006 issue of John Hagee's own bi-monthly Cornerstone Church Magazine (see images below), which features a mushroom cloud on the cover with the title, "THE FEUD BETWEEN TWO FAMILIES: WORLD WAR III HAS BEGUN". Then, on page two of the magazine, we find a fund-raising pitch calling upon readers to "BECOME A PART OF BIBLICAL PROPHECY". So, how can readers become a part of biblical prophecy? 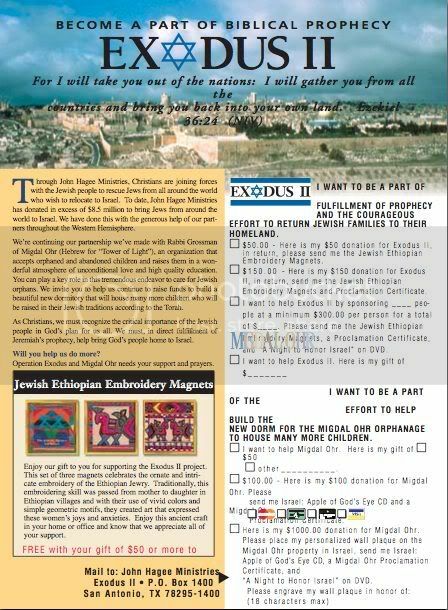 The fund-raising ad goes on, with text next to check-off boxes for donations of $50, $150, or $300 dollars to fund operation Exodus II, to resettle the world's Jews in Israel, that reads, "I WANT TO BE A PART OF FULFILLMENT OF PROPHECY AND THE COURAGEOUS EFFORT TO RETURN JEWISH FAMILIES TO THEIR HOMELAND". Gifts of $50 or more earn a special courtesy gift, Jewish-Ethiopian embroidery refrigerator magnets. In short, Hagee's own words and publications woud seem to directly contradict, and to a degree that approaches satire, CUFI publicist Morgenstern's claim that "Hagee does not advocate such an attack [on Iran] or seek to speed the "end of days" ". Clearly, John Hagee does both. Ari notes the lie-that-won't-die attacks on CUFI -- that its principal motor is a desire to bring about bloody end times. I do have a certain sympathy for Ron Kampeas' desire to challenge the view that CUFI's principle motive is "a desire to bring about bloody end times", because since my early days of writing on Hagee and CUFI I've come to the conclusion that Hagee's underlying agenda is really Christian supremacy--over Muslims, liberal Protestant Christians, liberal Jews, Catholics, Buddhists, Hindus, atheists, secularists, and pretty much anyone who doesn't cleave to the sort of charismatic evangelical Christianity John Hagee favors. But it's hard to see Hagee's rhetoric and leadership leading towards anything remotely resembling peace in the Middle East, except of the scorched-earth variety, and to say that CUFI's "sympathy for Zionism" extends to right wing Israeli claims on the West Bank" understates things by one or two orders of magnitude. 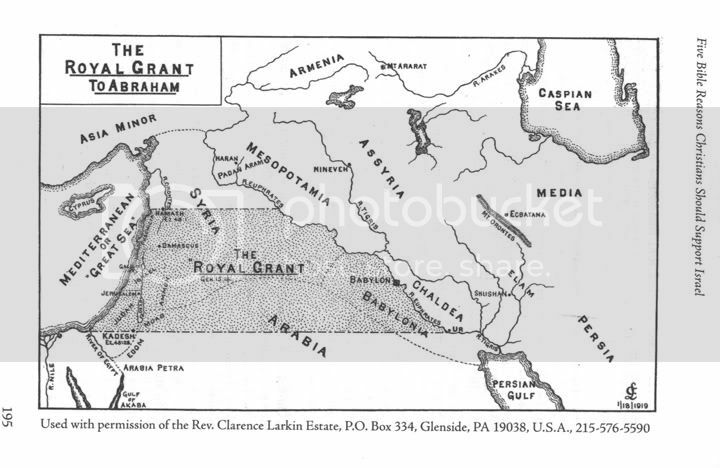 I have to assume Kampeas hasn't read what is perhaps Hagee's most notorious book, Jerusalem Countdown--having done so, he might have noticed the following picture from Hagee's book, which suggests per the title that a "royal land grant" from God to Abraham and his descendants gives Israel the right to lands stretching all the way to the Euphrates River. The implication is that Israel should encompass not just the West Bank but also most of Jordan, a fair swath of Saudi Arabia, and about half of Iraq. One wonders where the current inhabitants might go. "[Morgenstern] cites an especially egregious example in which Bruce Wilson quotes another writer's misbegotten conclusions about CUFI -- but attributes the quote to CUFI founder John Hagee, and not to the writer. Ari also notes that J Street's sustained attacks on CUFI have based themselves largely on this kind of journalism." "The Federal Reserve has never been audited, and yet it controls the value of money in this country...While most of the stockholders are members of the so-called Eastern Establishment, allegedly the four largest stockholders are not even Americans but members of the Rothschild family of Europe." Look, I've been reading these theories my entire adult life, and I can tell you this: Narratives about a powerful, secretive group controlling the world's finances are never, ever good for the Jews. I'd like to know more. So I'm ordering the books and CDs. He was correct to be concerned--the Anti Defamation League identifies this type of conspiracy theory, that Hagee has promoted (in a book published in 1996 and republished in 2000, and in a 2003 sermon broadcast around the world), as a "classic anti-Semitic myth")--but I've so far been unable to find Ron Kampeas' further investigation into the matter. ...And why don't we hear more about this in the press? [Larry] Kahaner says that police departments themselves carefully squash the stories." For all the hundreds, or thousands, of pundits, writers, editors, and journalists, politicians, religious leaders to have weighed in on the question of whether CUFI and Hagee are good or bad for Israel, or for Jews, shockingly few seem to have bothered to investigate John Hagee's many books and sermons, even though a fair number of the latter are now on Youtube. It's clear that Hagee, in 2008, is apologizing for the role the Holocaust has played in his theological explication of history. The Hagee-ologist Max points me to, Bruce Wilson, wrote at the time that Hagee was being crafty in his reply by focusing on a 1999 sermon instead of another in 2005; but the fact is, it is Hagee's critics who during last year's controversy (played out against Hagee's endorsement of Republican candidate John McCain) identified the offensive "God Sent Hitler" sermon as the one delivered in 1999. I remember it playing over and over on CNN; It's no wonder then that Hagee launched his apology by referencing that sermon. So why should Hagee not start out by referring to the 1999 sermon, since that is what his critics had made the crux of the matter? The reason Hagee shouldn't have done so is that the sermon in question wasn't from 1999, it was from late 2005, and I've never seen any evidence that a similar sermon from 1999 exists in the first place. I'm familiar with the issue, because I'm the person who brought Hagee's "God sent Hitler" sermon into public prominence. Kampeas seems wholly unaware of the fact, and though I can't blame him given that a number of contradictory accounts have emerged to explain presidential candidate John McCain's sudden rejection, in late 2008, of his long-sought political endorsement from John Hagee, Kampeas' confusion concerning this chapter of Hagee-ology suggests the need for more study. The idea that there was a "1999 sermon" or "sermon from the late 1990's" with the "God sent Hitler" statement came into being because I had obtained undated audio of Hagee's "God sent Hitler" sermon and determined that it could not have been from any earlier than the late 1990's--which is what I dated the sermon, in my YouTube video with the several minutes of audio from Hagee's sermon that came to vex the McCain campaign in late May 2008. I suspected the sermon was more recent than that but felt I had to be clinically scrupulous, especially given the loaded political nature of the evidence. As it turned out, the sermon was from John Hagee's late 2005 Countdown To Crisis sermon series (in which Hagee references hurricanes Katrina and Rita), that I later obtained in video format (the sermon was broadcast internationally on Christian networks) and which Hagee's ministry continued to sell even after Hagee's supposed apology the Foxman and the Anti Defamation League. After the "God sent Hitler" sermon audio clip had forced John McCain to hold a press conference renouncing Hagee's political endorsement, Hagee himself held his own press conference, in which the CUFI head complained that he was being attacked for something he had said "decades ago". Then, in an "apology' to Abraham Foxman and the ADL, Hagee suggested the offending item was from a sermon he had given in 1999. But as of May 2008, John Hagee's now infamous "God sent Hitler" sermon was little over two and a half years old. Ron Kampeas seems not to know any of this, but I find it hard to forget, especially given that as the video I first posted in early May 2008 on Youtube zoomed towards 100,000 views, I found myself on the phone with a MSNBC executive producer who needed to confirm the provenance of the Hagee audio I'd dug up. By that time, researcher Rachel Tabachnick (who has since written extensively on Hagee and Christian Zionism) and I had determined the exact source of the "God sent Hitler" sermon audio--Hagee's late 2005 Jerusalem: Countdown To Crisis 3-sermon set, which MSNBC proceeded to order express mail; and thus Hagee's "God sent Hitler" claim appeared on Keith Olbermann's Countdown show. I'm mentioning this history because it was my primary research--listening to many Hagee sermons, that generated the controversy over Hagee's "God sent Hitler" statement in the first place--which Ron Kampeas is wholly unaware of, from what I can tell, from his extended war of words with Max Blumenthal (1, 2) that, concerning the facts of the "God sent Hitler" affair, are hopelessly inaccurate and garbled. But, being human, we all make mistakes--and so I won't repay the favor and suggest that this somehow discredits everything that Ron Kampeas has written or will write in the future. Writing on the flap, Kampeas chose to characterize Brog's protest against Milbank's critique with the three-word blog post title: Worst. Defense. Ever. But accurate anyway IMO, even though he didn't say those exact words. If you put things together, they add up to "attack Iran to bring about Armageddon". Conveniently ignoring the scriptures that decry this sort of thing. I think you're hitting close to home and they don't like it.